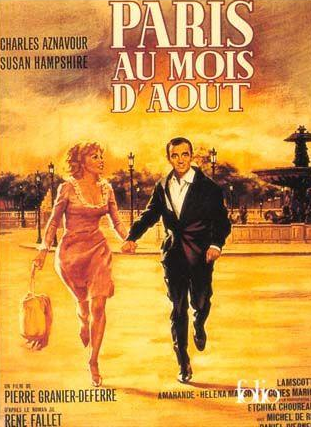 “Paris in August”: it’s even a film (and a novel). There are many paradoxes in France, the most famous of which is probably the incredibly high ratio of patisseries and steak tartare to slim French people with no more heart disease than anyone else. Why aren’t the French fat and dying young? That particular French Paradox has engendered a whole industry of envy and literature. Less well-known but, frankly, even more confounding, is the August Paradox. 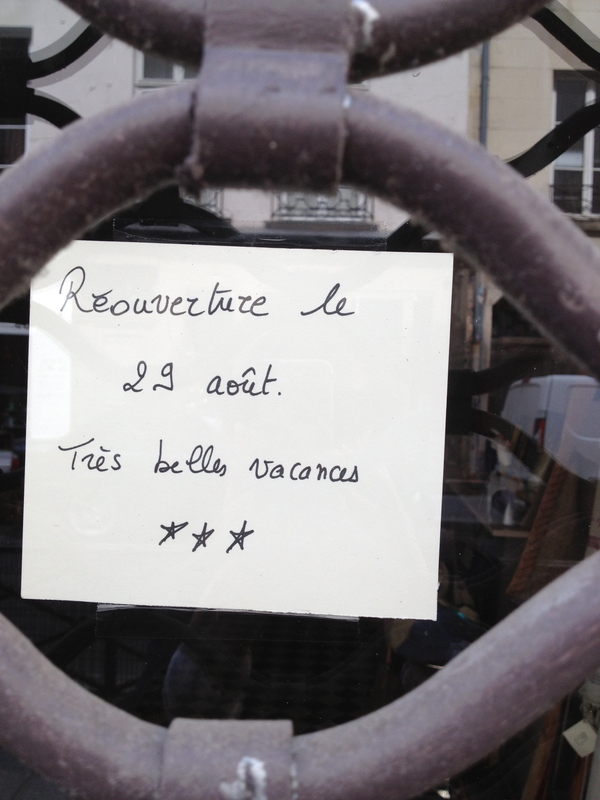 Contrary to national stereotypes, the French are actually not total flâneurs. Far from it. (In fact it’s a stereotype that can get even the most delightful French journalists all worked up). 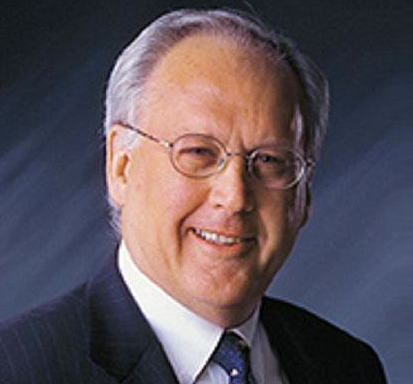 You may recall the highly-tweeted episode this winter, when the American C.E.O. of the tire company Titan International, Maurice Taylor, lashed out at workers and unions in France saying French workers just sit around talking a lot and taking long lunch breaks. Turns out that in citing that national stereotype, Taylor was just reinforcing another national stereotype—of Americans as boorish, with a propensity to mild jingoism. Maurice Taylor, boorish, with a propensity to mild jingoism. Recent (and less recent) studies show that not only are French workers more productive than German workers (good to know these days when Germany is allegedly the labor model to which the rest of Europe should aspire), but they’re only marginally less productive than American workers. And American workers actually work 23% more hours than the French (who actually work more hours than the Germans). Mr. Taylor is free to think and say what he wants, and to be honest, he’s probably not the only one thinking that, but the statistical reality is that France, despite the image it projects, is the fifth biggest economy in the world. And with a population that is 20 percent of the United States population. And with the month of August. Now let me explain August in Paris. The city is a ghost town (and for those of you familiar with August in Paris, let me know if you think this summer’s ghostlier than others). 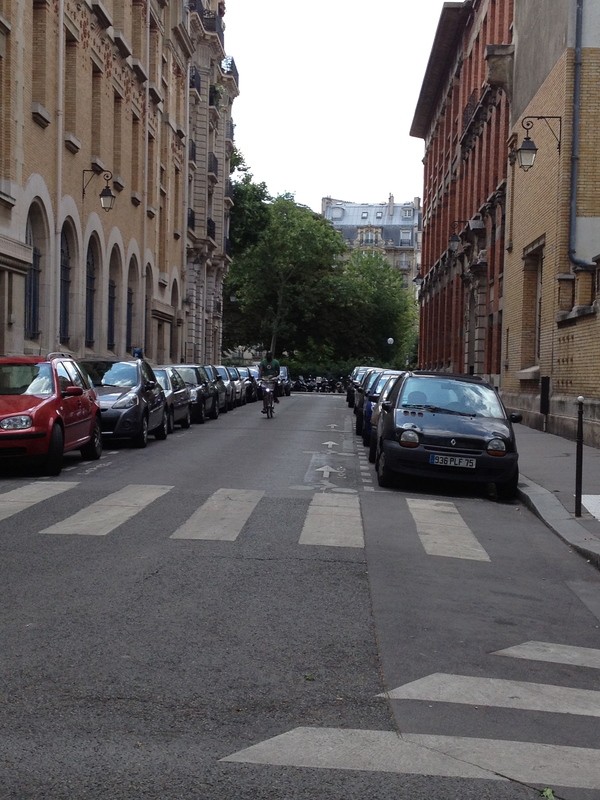 You can cross the boulevard without looking, and ride a Vélib bicycle the wrong way up a one way street, because even if there is a car coming, there is a sense of complicity among the few warm bodies still hanging around this joint, something like “You too, eh? Here, let me give you a wide berth and hang in there, man.” Come September, that car will honk angrily and the driver will spit at you. 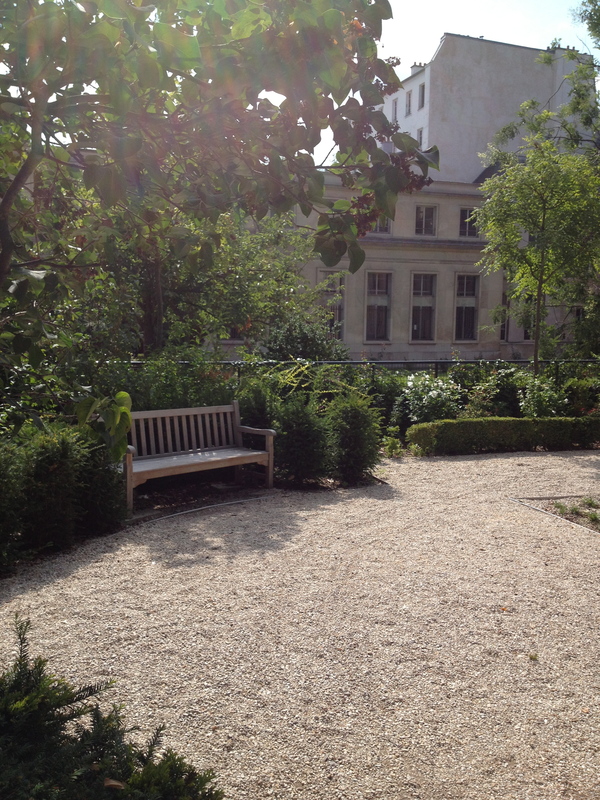 An empty park bench at lunch time in a lovely public garden. Only in August. More seriously, the city is at a commercial standstill. For most of the merchants still open last week, Friday or Saturday was their last day of business before shuttering up for three weeks (although a few, economic crisis oblige, are leaving for just two weeks). Market stands were hawking at half-price whatever limp produce they had left, and restaurateurs were serving truncated menus with only half their normal dishes in order to empty out the larders. Eyes were sparkling, waiters practically jigging, and you could sense it wasn’t the night to linger over that rest of the bottle of wine. As of Sunday, in every street, metal shutters were drawn over storefronts with the telltale piece of paper taped in the middle, announcing the dates of departure and return. There was even the occasional emoticon. Have you noticed that so many of the Vélibs (Paris’s free public bicycles) seem to be missing or broken or have flat tires? 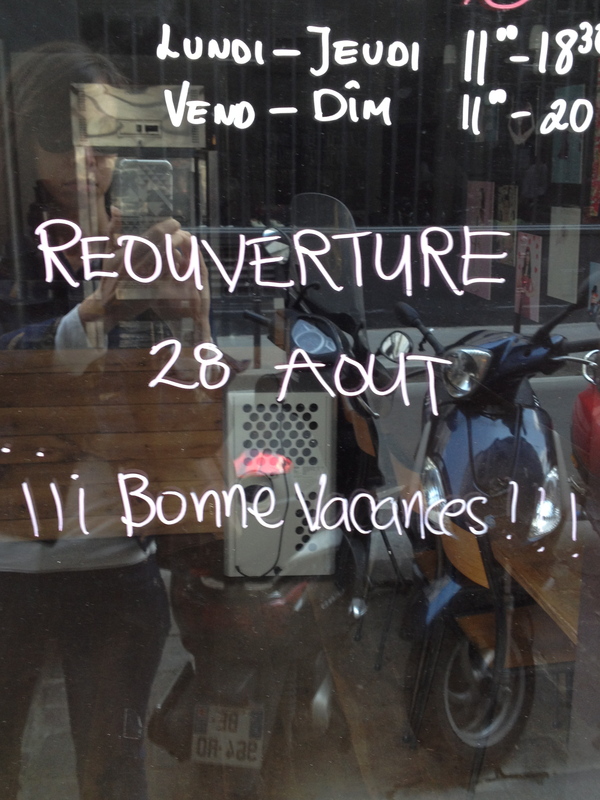 It’s August and everyone’s working at half-staff, Vélib maintenance included. In fact the only maintenance workers on duty are the métro staffers, because in August, since no one—pretty much literally—is around riding public transportation, that’s when they shutter whole lines for several weeks. Have you ever had a medical emergency in Paris in August? Don’t. I had a scheduled surgery a few years ago in the summer, on the last week this chief surgeon in a public hospital was taking appointments: the first week of June. Small businesses will shut down entirely and the whole staff will take leave at the same time—because there aren’t any clients around to do business. In large companies, the executive offices will be empty, a skeletal staff will stick around enjoying the absence of phone calls and emails, and sometimes company cafeterias will just close. 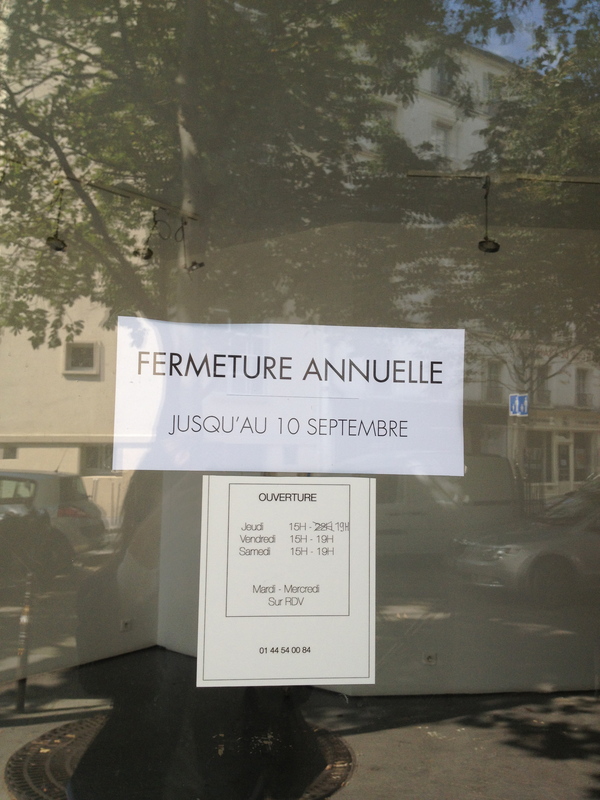 I worked for many years at a 24-hour international news network, a French-style CNN, and yet every summer, just like the rest of French media, the bosses’ offices would empty, the number of news bulletins would shrink, shows would be suspended until fall. As though the rest of the world’s news went on holiday in August like it does in France, where French newspapers run light summer series and reduce their news pages since, well, there’s really no news (N.B: this week’s headline is the revolt of angry egg producers who are smashing their stocks because of low prices. Believe it or not, this is interesting, so come back here for more on this shortly). All I can say, unlike Maurice Taylor, is bravo. Although I, too, find French unions often dogmatic, and I actually feel quite torn about the August Paradox. I find the August ritual freakishly normative, and alienating for people who don’t have the option to leave (I could plan to be out of town if I chose to). I also find it really annoying when metro stations are closed, when my boulangerie is closed, when all the damn dry cleaners are on holiday (who’s got office clothes to wash? ), when my French colleagues didn’t seem to think that there was a credibility issue for a network allegedly covering international news to scale down to a “summer news schedule.” How can any industry, let alone a whole economy, be globally competitive when three months of the year feel like write-offs (June is counting down, July is wrapping things up, and August is a black-out)? 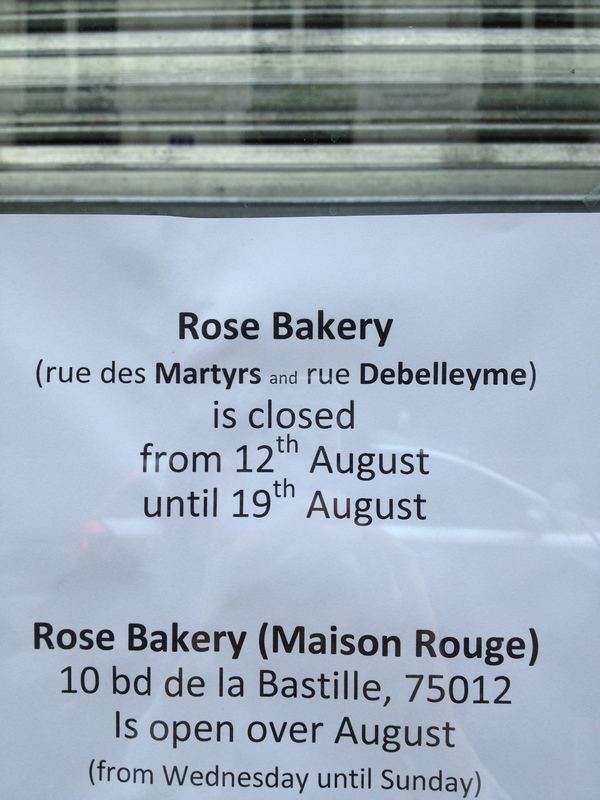 Like so much about French culture, August is deeply resistant. And yet like so many other French rituals, August seems, paradoxically, to be highly functional. The August paralysis, this highly-protected custom of total shutdown, doesn’t seem to have made France the country of sclerotic inefficiency that Maurice Taylor claims. So bravo, because if you can take the most significant amount of vacation of any country in the world and still be more productive than the Germans, well, then you’re getting something right.